'The Thing & The Human Torch by Dan Slott' review: The Fantastic Four are in good hands – AiPT! Get a taste of the Human Torch and The Thing from Dan Slott from 13 years ago. It’s a great time to catch up on Fantastic Four stories now that Dan Slott has taken the reins of the new series. Even better is rereading old Fantastic Four stories written by Dan Slott. 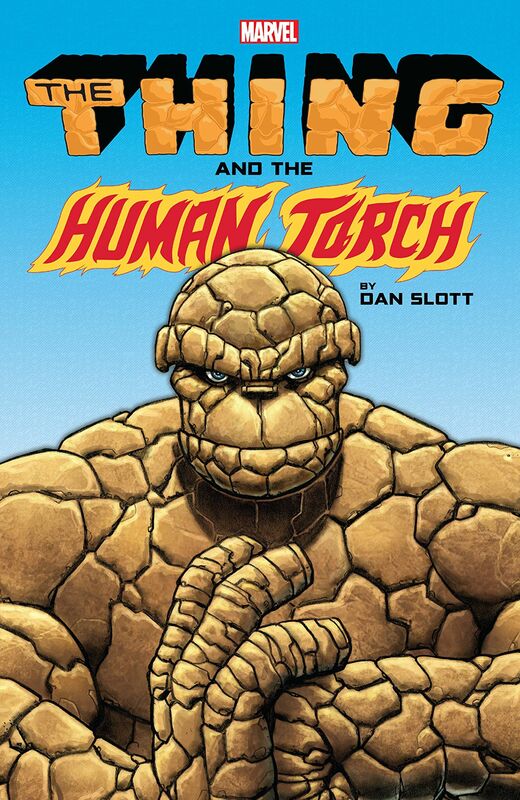 This week, Slott’s run on Spider-Man/Human Torch and his The Thing miniseries are getting collected in one 316 page book featuring two of the main Fantastic Four with plenty of cameos from Reed and Sue too. Dan Slott takes on half of the Fantastic Four — and, naturally, the ever-amazing writer brings Spider-Man along for the ride! First, the Human Torch and Spidey’s unique friendship is explored across five adventures in different eras. From high school to adulthood, from the Coffee Bean to the Negative Zone, from Dorrie Evans to Mary Jane Watson, it’s the ultimate team-up of flamebrain and web-head! Then, the ever-lovin’ blue-eyed Thing takes the spotlight! The idol of millions is now worth billions, and he’s enjoying his newfound riches — not to mention the odd game of poker — with pals including the FF, Goliath, Hercules, Lockjaw and, yes, Spider-Man! But fear not — bashful Benjy has reserved some clobberin’ for foes like Arcade, Shockjock and classic sparring partners Trapster and Sandman! These two arcs were originally written in 2005, long before he took over Spider-Man in 2010 and even longer before he took over Fantastic Four this month. It’s a fascinating read in part because you can see why Slott got both jobs as he has a great handle on Spidey and the first family. Both series are also great fun in their own right and should be owned by Slott completists. This book starts with the five-issue run of Spider-Man/Human Torch which is a one-shot style story showing the relationship of Peter and Johnny throughout the years. Slott does a great job with showcasing Peter’s life at different times, from living with Aunt May to dating Black Cat and wearing the Symbiote costume. The dynamic between these characters is great fun and it’s immensely easy to drop into each story since they wrap up each issue. The last issue even pulls it all together with a nice sequence building on the bond these characters had over the years. It’s also interesting to see how the characters grew up and how their personalities match so well. A little over half of this book is then devoted to Dan Slott’s run on The Thing, which ran for eight issues. This story is all about the new life Thing has as a billionaire. It’s a clever idea since he’s such a downtrodden character and Slott does a fantastic job of exploring his personality now that he’s filthy rich. Money, of course, doesn’t solve everything, and it gets his love life to an interesting place. Supermodels want to date him, but his heart is still set on Alicia Masters. There are a plethora of villains to fight (Like Arcade, Sandman, and Shockjock to name a few) further complicating Ben’s life. The joy of this run is in how well Slott captures Thing’s personality and how he’s an ever-loving person who really just wants to be left to relax but never can. The art in this collection is quite good with Ty Templeton penciling the Spider-Man/Human Torch portion of the book with Andrea Di Vito and Kieron Dwyer finishing with The Thing. Templeton has a great classic style that suits the story, hopping around in Marvel history. Di Vito’s art is super detailed and Thing’s appearance is particularly realistic looking. Dwyer closes out the run with a cartoony sort of look that suits the lighter adventures (Hercules gives Thing trouble in one story, and then we get a poker game finale). The title feels a tad misleading seeing as Spider-Man is half of the focus for the first half of the book. The Thing barely shows up in these stories (and the first family shows up rarely) since it’s mostly about Spider-Man and Human Torch rubbing each other the wrong way. Then you have the second half which is also lighter on the Fantastic Four, though they do pop up much more than in the first half. The title may have been more accurate as The Thing or the Human Torch. Another gripe is how The Thing rushes to bring our rocky hero and Alicia back together after building up their tumultuous relationship in the first few issues. I’m thinking this series was canceled earlier than planned due to the broad strokes being off. A good collection that’s fun to read simply knowing 13 years later Dan Slott would be writing the Fantastic Four after a long hiatus. If you’re nervous about Slott’s new run on the FF, just read this and you’ll realize he has a great handle on these characters, but also a strong focus on family. This is also basically recollecting two trades that have been out of print for some time. A fun collection revealing how good Dan Slott is at writing these characters.